This week's issue of Businessweek has a solid article about how Yahoo! is trying to avoid a repeat of its China mistakes in Vietnam. Yahoo! 360 is very popular among Vietnamese bloggers, but Yahoo! has decided not to host the service out of Vietnam, opting instead to host the Vietnamese Yahoo! 360 in Singapore. Yahoo!, along with Google and Microsoft, is a member of the Global Network Initiative, a multistakeholder initiative launched last Fall aimed at upholding principles of free expression and privacy in the Internet and telecommunications industries. All three corporate signatories are now applying the GNI principles to decisions they make about operations not only in Vietnam, but in many other markets. In South Korea, after a law recently went into effect requiring the collection of users' real names and ID numbers, and handover of user information to the South Korean government upon request, Google chose to disable video uploads and comments on the Korean version of YouTube, recommending that South Korean users use other international versions of YouTube - not subject to South Korean jurisdiction - instead. It has been more than half a year since the Global Network Initiative on free expression and privacy was launched with some fanfare as well as some criticism. The main headline: Google, Yahoo! and Microsoft made a public commitment to free expression and privacy, signing on to a set of common principles and agreeing to be held accountable through a system of reporting, evaluation and monitoring. I've been involved with the process of forming GNI since 2006. It wasn't easy: it took a year before the participants were even ready to admit publicly that they were sitting down together with human rights groups, free speech activists, socially responsible investment funds, and academics to create a set of principles which they would then be held accountable for upholding. Now the big challenge is to recruit more companies. The organization's structure is still being set up, and the search for an executive director is underway. The GNI is beginning to issue public statements: In March the group expressed concern about lack of transparency and accountability in the way that various governments around the world have been censoring YouTube. The GNI more recently reiterated the commitment of participating companies to "continue to take steps to minimize the impact on users and the public and to encourage governments to protect the right to freedom of expression." Since the initiative's launch, GNI members have discussed the organization and its objectives in several public fora. At the bottom of this post I've embedded the video from a GNI panel at a Berkeley conference on human rights, technology and new media. Watch it for a discussion of the initiative's goals, activities, and motivations in great detail. Last Wednesday I moderated a panel about GNI at the 7th Chinese Internet Research Conference held at UPenn. It was live-blogged by Ethan Zuckerman and by Lokman Tsui. Conversations leading to the GNI's formation were motivated in large part by the fact that the three participating companies were hauled in to congress and yelled at in February 2006 for their roles - to various degrees - in complying with Chinese government demands for censorship and surveillance. But all members of the GNI (including myself) insist that while its formation may have been spurred by events in China, this is a truly global initiative: there is no country on earth where companies aren't under some kind of pressure from government to do things that infringe on individual civil liberties. The GNI is meant to be a set of global guidelines for how to handle these pressures - from China to the U.S. to anywhere in between. That said, the GNI panel at last Wednesday's Chinese Internet Research Conference was a great opportunity to get feedback from Chinese bloggers, activists, academics, and others. Isaac Mao talked about his open letter to Google , written two years ago but never responded to. He believes that global companies should do more than just try to minimize harm: he argued that they could do more to actively help to support an independent discourse on the Chinese Internet. They are already doing some things, like enabling https on Google Reader, Google Docs, and so forth, but he believes they could do more to make their blogging tools accessible, and to help China's independent bloggers support themselves through Google Adsense. When asked whether he thought that the GNI was too much of a "Western" thing, he responded that the values it espouses are universal. He did express concern however that the structure of GNI seems to be geared towards large companies, and wondered whether startups had the staff or capacity to join. "Michael Anti" (real name: Zhao Jing), the blogger who was censored by Microsoft back in late 2005, was also in the room. I called on him to comment. He said that even though he was unhappy with Microsoft for having deleted his blog, he disagreed with human rights groups who believe that Western internet companies should pull out of China in order to avoid all compromise. "Chinese civil society really depends on Google services," he said. Without Google groups, docs, gmail, and so forth, he believes it would be even harder for people to discuss things the government doesn't want discussed. That said, however, like Isaac, Michael believes that Western companies owe it to Chinese Internet users to help them out as much as possible. His message to companies: "When you do business in China, we exchange our freedom to help you succeed. You should do something for us in return because we have chosen to ignore your compromise with the government." Both he and Isaac believe that in the long run these companies will be rewarded with Chinese users' respect and loyalty. Google's Bob Boorstin seemed to be taking it all on board. He did point out that Google Grants (in-kind advertising for non-profit organizations) are now available in China. Ang Peng-hwa of Nanyang Technological University in Singapore observed that while the Chinese are not "genetically predisposed to censor" it would also be unrealistic to expect that the whole world will adopt an American-style "first amendment:" different societies are going to arrive at different balances between civil liberty protections and the desire to maintain stability and security, and fight crime. That said, he also thinks that a global initiative supporting free expression is worthy, because in countries that censor heavily, civil society is weak making home-grown initiatives difficult if not impossible. But global efforts need to be done in a realistic way. He suggested that the GNI might want to emphasize the issue of third party liability: in some countries (like the U.S.) web services that host blogs, wikis, and other user-generated content aren't held legally liable for content posted by their users, making it harder for governments to force them to censor. In places like China (and many other countries), companies are held responsible for everything their users upload. Focusing on best-practice legal frameworks may be less ideologically explosive and easier to discuss in countries where terms like "free speech" are ideologically loaded. A big weakness of the GNI, as members themselves have acknowledged, is that so far only American companies have joined. The hope is to recruit European and Asian companies over the coming year. As Boorstin pointed out last week, all companies should recognize that doing good and making money are compatible. Joining GNI is a public commitment to users that you're not just going to talk the talk, but you're going to walk the walk in a transparent, accountable, and credible way. There's been a global argument going on for some time now over how the Internet should be governed. Many governments, including China but also many others, are not happy that the "root" of the Internet is controlled by the Internet Corporation for Assigned Names and Numbers (ICANN), which ultimately answers to the U.S. Department of Commerce. In 2005, there were proposals from various countries to move Internet governance from ICANN to a United Nations body of some kind, or something that would give more representation and power to a variety of governments. But there was no consensus. Human rights groups were rightly concerned that giving governments like China and Iran greater say in Internet governance would lead to more censorship and the elimination of privacy and anonymity. At the 2005 World Summit on the Information Society in Tunisia, local dissidents got roughed up, a workshop on free expression nearly got shut down by the host government, and governments agreed to stick with the ICANN-led status quo for lack of any reasonable consensus. The Internet Governance Forum was formed as a platform to continue consultation and feedback from governments and a range of "civil society" groups, including coalitions calling for the protection of human rights and free speech. CHINA: Thank you, Mr. Chairman. Thank you, Mr. Chairman. On behalf of the delegation of China, I would like to present the position of the government of China on the fourth session of the IGF. First of all, on the title -- the global title of the meeting, the delegation of China prefers the proposal put forward by Egypt, "Internet, an opportunity for all." We think that this topic is very closely linked to the international financial crisis we're going through at the moment. And in addition, it proves that the United Nations continue to work in order to promote the Internet. As we have said in February, the rights and principles for Internet is not an appropriate theme because the words "rights and principles" don't have an appropriate definition. As a meeting of the United Nations, it is not appropriate to adopt a theme which is not properly defined. And on this matter, we suggest that we discuss the definition of "rights and principles" first of all, the workshop level. Honorable Chairman, secondly, on the management of critical resources, the delegation of China feels that, first of all, the title of this theme should be "managing the critical Internet resources." We feel that this title has been defined last year, after extensive discussions. And we think that this is a fairly neutral title. At the same time, it is a very sensitive theme, and we would suggest that we continue using this title this year. Also, we would like to stress the fact that under the theme of "critical Internet resource management," we think that JPA is a very important theme and that it's not because we're going to reexamine JPA in September that we can't discuss it at the fourth session of the IGF. On the opposite, it's because we're going to do this in September that we should do it in IGF, too. Thirdly, now, as to security, the delegation of China feels that this is a very important question. At the present time, security in the Internet, on the Internet and cybercrime is something that has become a worldwide enemy. And here we need to talk about regrouping the energies and resources of all parties concerned and to strengthen the international mechanism in order to promote security and stability for the Internet at the worldwide level. We also think that there are some vital matters that have not been incorporated on this theme, for instance, how do we promote open source or intellectual property or traditional library resources. These are all very important questions in order to promote dissemination of knowledge. We also think that this is a theme which should be discussed in the opening title. We have also noted that some have talked about the URL blocking. On the URL blocking, this is a very sensitive matter. This afternoon, we are talking about the value of the IGF. And that's a very important question. The delegation of China has followed very carefully the previous statements made. And now the delegation would like to make the following points. Firstly, we very much appreciate the secretariat for their excellent work. We agree in principle with what has been said by previous speakers on the specific aims of the IGF. We feel that the IGF has contributed a great deal in light of its historic mandate. But we have also noted the -- that the essence of IGF's work is establishing dialogue, exchanging points of view. But this is not enough to solve the problems. 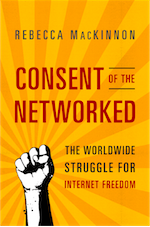 The real problem is that in the field of the Internet, there is a monopoly that exists. And we need to solve that problem. It's not by talking about principles merely that we can solve this problem. So we repeat that the delegation of China does not agree with extending the mission of the IGF beyond the five years. We feel that after the five years are up, we would need to look at the results that have been achieved. And we need, then, to launch into an intergovernmental discussion. I think that this should be a positive result of IGF's work. The work of its next phase should be based on the results achieved in the previous years. We need to launch an intergovernmental discussion in order to solve the real problems that exist in this field of Internet governance. True, it's just a shame that China had to be the stakeholder to make this bold point, since its motivations are transparently undemocratic - it was, for example, the only stakeholder at yesterday's meeting to openly oppose the inclusion of Internet rights and principles as theme for an IGF main session. But from whichever source the realisation comes, given that the WSIS dream of a new consensual model of multi-stakeholder engagement in policy development has failed, it may be that we have to bite that bullet and fall back on the ugly alternative of agnonism - the recognition that the engagement of governments and civil society in global politics is inherently dialectical and conflictual, and that they will never truly deliberate as equals. This might not even be such a bad thing. It need not in fact spell the death of the IGF, but rather its rebirth; as it would free the institution to make a clean break from its stifling Secretariat and the United Nations system generally. It could instead reconstitute itself as an independent private international institution much like ICANN itself, that would seek to participate on an equal footing in whatever institutions hold real power in Internet governance in the future, perhaps including Reding's new G-12 (or IG20, as Wolfgang Kleinwaechter had presaged it). It's going to be an interesting year for Internet governance, and we are certain to hear a lot more from China. As it so happens, I'll be attending the next ICANN meeting in Sydney as well as the IGF meeting in Egypt as part of my research for my book.